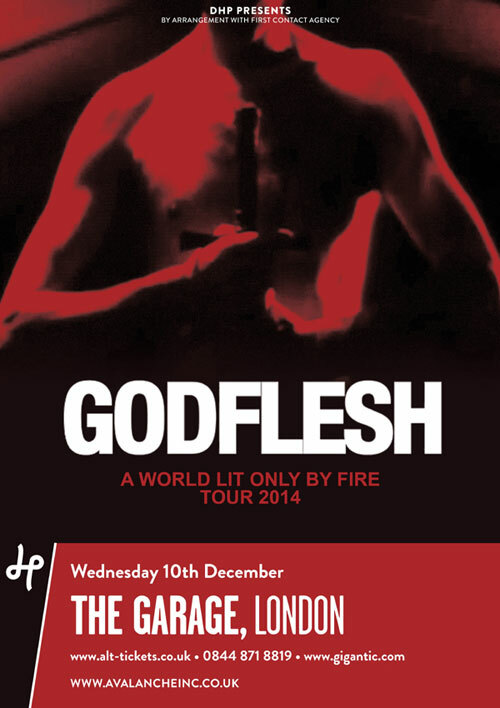 It’s safe to say, given the experimental nature of Godflesh, the support acts for tonight’s show are going to be anything but ordinary. Opening the show, Brummy experimental outfit Khost are a hypnotic blend of ethereal ambience and crushing heaviness, sitting somewhere happily between the music the current line-up of Negura Bunget are producing mixed with Sunn O))) and Godflesh’s first album. Surging pulsations of samples and pan flutes are interspersed with the occasional languid riff making for something utterly compelling. The entire performance seems to be building towards a huge, clamouring climax and they certainly don’t disappoint, sending waves of noise crashing down upon the audience. Second act, Ramleh, are a duo comprised of a guy stood at a mixing desk and a bloke, that looks akin to the creepy uncle you try to avoid sitting next to at family functions, on vocals. The power electronics this pairing produce are abrasive and unsettling and while a choice few seem to genuinely enjoy it, the vast majority of the crowd either head outside or stand looking puzzled. The jarring, offensive parping surging forth from the speakers is occasionally cut through by the vocalist shouting, like a drunken tramp, things like “please forgive me!” Forgive you for what, the dreadful music? That’s a pretty huge ask. By the time Justin K Broadrick and G.C. Green take the stage, The Garage is stiflingly full with an eclectic (and smelly) mix of people. The first half of their set relies heavily on newest effort A World Lit Only By Fire and Godflesh erupt the stage with New Dark Ages, causing chaos within the audience, as a vicious and energetic pit opens up at the front. The industrial tinged cacophony made up by Broadrick’s guitar playing and Green’s rumbling bass is accompanied as ever by their trusty drum machine and Broadrick’s vocals roar out across the venue like half mad barks. Of course, there’d be a lynch mob assembled and out for blood if the duo didn’t return to some of their earlier (and more popular) back catalogue, and towards the end of the set classics from seminal record Streetcleaner make an appearance, including the title track and Christbait Rising. These heavy duty numbers cause the wildest reaction of all from spectators and people are parted like the Red Sea as feet and fists fly. Old fan favourite Like Rats of course makes an appearance, as the encore, and it’s plain to see this is the song everyone has been waiting for, as there’s roars of approval as the first chords ring out. It’s plain to see, almost three decades since their inception that Godflesh are still on incredible form and without a doubt the best at what they do.